About C. Palmer Mfg. Co. Inc.
Carmen Palmieri founded our company in 1943, in his basement with no money and a strong desire to work. 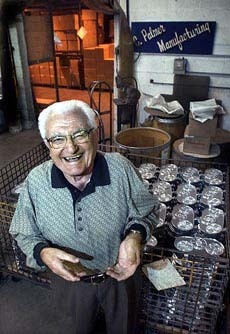 The first aluminum castings he made were tiny Italian cookie irons. He was then approached to making sinker molds, after some time making these for others; he decided to create a whole line of molds with his name being the brand. Unfortunately, at that time in history, trying to sell products under an ethnic name was difficult. The name was Americanized to C. Palmer Manufacturing, Inc.
As the business continued to grow the product line became much larger. In the late fifties, the business was too large for the basement to handle, so Carmen and his first son John built the company's first plant. John was fresh out of the Navy and anxious to help his father. Being in electronics in the Navy, he had several new and innovative ideas for products, as well as plant automation. The company came out with the first electric Pizzelle Iron as well as the Palmer Sandwich Toaster. Sales were booming and it did not take long to outgrow the existing plant, so again it was time to expand and land was bought, and in 1964 a new plant was built with more than enough room, or so they thought. John designed and implemented a fully automated sand casting system. Many companies revered the system. A national electronics manufacture sent a few of their engineers to observe the system. They were impressed and amazed that such a small company could have so much automation while not having the resources of a larger conglomerate. They asked to use some of the ideas that John had implemented, the request was honored. Seeing an easier way, in 1976, the company bought their first aluminum die cast machine adding a vast improvement in quality of the product and the secondary operations were decreased. In the late 70's, it was decided to add our own Tool and Die department. This has been one of our greatest assets. We offer the service of building our customers' dies at minimal charge. This is like making an offer that cannot be refused, as the cost savings are in the thousands. In 1979, Carmen decide to retire, fortunately for us he forgot to stop coming to work and up to the age of 96 he kept his 7:00-3:30 work regime. Again the company was growing so expansion was necessary, and in 1980 an addition was built and another in 1982. In 1984, Philip, John's first son joined the company and began to bring the company into the computer age. The sand casting part of the company was phased out and converted over to die castings. In the late 90's, still growing by leaps and bounds, and with two of our largest customers having expressed that their current level of purchases increasing for the next season by 40% to 100%; we again found it necessary for expansion and a second division, C. Palmer Die-Casting, Inc. was opened in Oakland, Maryland. In March of 2011, C. Palmer Mfg lost their founder. Carmine "Carmen" Palmieri, 96, of West Newton, died Friday, March 11, 2011, in Excela Health Westmoreland Hospital, Greensburg. He was born June 12, 1914, in Lettopalena, Italy, a son of the late John and Assunta (Tranchni) Palmieri. Carmen was the founder of C. Palmer Manufacturing in West Newton, a business that he started in the basement of his home in 1943, moving from there to a machine shop and foundry that was built behind his house in 1950. Then in 1962, he incorporated the business and moved it to its present location in South Huntingdon Township. Over the years the business has evolved to now being a high tech aluminum die casting company. He was a member of Holy Family Catholic Church in West Newton. Surviving are four children, John Palmieri and wife, Kathryn, Rita Gabonay and husband, Robert, James Palmieri and wife, Mary Beth, and Janet Brinker and husband, Paul. This was a sad day for all of us. His friends and family miss his smile and his ability to always make you smile with a joke. He was a hard worker and dedicated to his business; the employees miss having him around, giving advice and more importantly a helping hand.